Did you want to buy a car mount but at the same time you also need a car charger ? To buy a car charger or a car mount, that is a question. 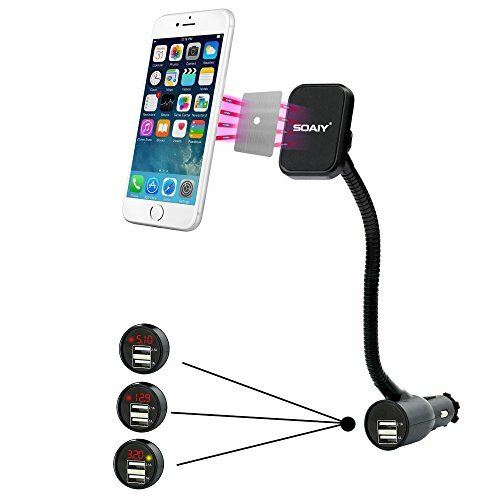 SOAIY dual USB magnet car mount charger can help you resolve this problem and you can own these 2 convenient gadgets with one purchase. This will be your best choice if you are the Uber driver. Also it is good for long trip driving!!! It is NOT a wireless car charger, you need to use with your cell phone's charging cable, and the USB charging cable in the description is NOT included. 1. Fast charge with one 2.1A and another 1A USB charging port, Dual （2）USB Charger Ports with a Maximum 3.1A Output suitable for cell phones and tablets and GPS devices. 2. Magnet mount is suitable for more kind of devices , and will not cover any buttons . It will be more convenient for operation. 3. LED Display Screen Shows The Real Time Of Vehicles' Battery Voltage, Devices' Charging Voltage and Charging Current in turns. Easy To Monitor The Health Of Your Battery And Allows You To Know When It's Time For A Replacement. You can charge your phone while using GPS. 4. 360 degrees Rotation Knob and Flexible Design to Easily Get Your View. 5. Inset into Cigarette lighter will not block view sight while driving. 3-in-1 Multifunctional - Magnet Car mount with charger , additional LED display screen car voltmeter circularly shows the vehicle's battery voltage, device's charging voltage and charging current in real time, easy to monitor the health of your vehicle's battery and allows you to know when it's time for a replacement. Cigarette lighter cellphone Mount & Magnet Car Mount -Strong magnet holder help you hold your phone tightly, at the same time the cell phone's button will not be covered. As the car holder is suitable for cigarette lighter instead of the Windshield, it will not block your sight while driving. Easy to Install and release with just one hand. 2 USB Charging Port - Dual 2 USB charging ports, 2.1A + 1A Maximum 3.1A Output allows you to charge 2 devices simultaneously. Intelligent protection circuit protects against over-voltage, over-current and over-heat. Flexible goose neck and 360 degree rotating - Allow you to position your phone or GPS horizontally, vertically, or tilt in any direction, provide the optimal viewing angle, view your device at any angle or orientation while driving. Widely usage: Fit for most cellphones and GPS, this car mount charger is for iPhone7 7plus 6s 6s plus 6 6plus 5s and Samsung S8 S7 S6 S5 S4 Note 5 Not 4 Note 3 ect. SOAIY provide you one year warranty with quick and friendly customer service, if you get any problems to use the car mount charger , please contact the seller in your order page , we will be happy to help you .